Video clip synopsis – With its revolutionary approach to depicting the landscape and light, Tom Roberts’ Bailed Up is a painting that helped define Australia’s national identity. Broadband MP4 tomrober_bb.mp4 (17.4MB), suitable for iPods and computer downloads. Tom Roberts’ Bailed Up is an episode of the series National Treasures produced in 2004. If you were to nominate one painting as Australia’s greatest, what would it be? Curator Barry Pearce of the Art Gallery of New South Wales explains why Tom Roberts’ Bailed Up would be a contender, and Warren Brown ponders the extraordinary lengths to which Roberts went to complete his famous artwork and how close we once came to losing this national treasure. Tom Roberts was one of the ‘Heidelberg School’ of Australian artists of the late nineteenth and early twentieth century. These painters introduced a ‘plein air’ style to depicting the Australian bush, using impressionist principles to capture the light, colour and atmosphere of the Australian bush landscape and sky. The school was closely tied to an emerging Australian nationalism, which saw the acceptance of Australian scenes and people as suitable subjects for art. Other members of the ‘school’ included Arthur Streeton, Charles Conder, Frederick Mc Cubbin, David Davies, Jane Sutherland, and Walter Withers. There are many examples of Heidelberg School words in Australian state galleries. What changes did the painter make to it? Why would he have made those changes? The painting is a representation of bushrangers. Analyse the representation – what does it show? What attitudes and values are shown? Who are we meant to sympathise with? How does the artist direct us in this way? 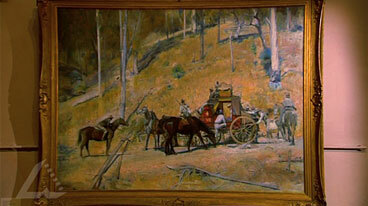 What is the message of the painting about bushrangers? Is this a true image? Compare it to other images of bushrangers. This painting is about ‘outlaws’. But what does the word ‘outlaw’ mean, and what variations are there within the word? The word literally means ‘one excluded from the benefits and security of the law’. But there is a range of meanings within that definition. Look at this list, and match the appropriate definition to each. Some of these words are neutral in their meaning, others involve a judgement. Place each of these eight ‘outlaw’ words on this scale, from the worst type of outlaw to the best. For example, you might decide that a criminal might be close to the worst, because their actions harm others but are done just for their own benefit. The different words used to describe outlaws raise the question: Were bushrangers romantic heroes, or were they villains? Brainstorm your idea about heroes. From your brainstorm, work out the criteria you would apply to decide how you would judge bushrangers. Research the lives of two Australian bushrangers and prepare an argument either for or against their classification as ‘heroes’ or ‘villains’, making sure that you apply your criteria in your judgement. Present your argument to the class.